It’s CRPS Awareness Month. RSDSA has several events happening all over the country this month. We will also be sharing some stories of hope and stories to raise awareness for CRPS/RSD. We were recently introduced to Keegan, a teenager who was recently diagnosed with CRPS. 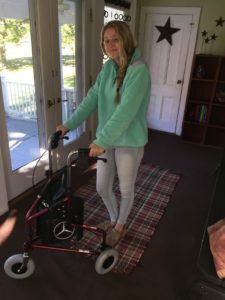 She’s not just any teenager; she instantly wanted to raise awareness for CRPS/RSD. Read a little bit about her and about her event! She wrote this blog to kick off our awareness month! Hi all! Happy National CRPS and RSD awareness month! My name is Keegan I’m 15 years old, here’s a bit of my story. I left my hometown of Poughkeepsie New York in August to take on a new challenge. I moved to North Carolina so I could get residency to go to UNC Chapel Hill when I started college. I was incredibly proud of myself for moving halfway down the coast in with some family I had in Raleigh to eventually further my education. It was hard leaving family and friends, but I did it, and couldn’t be happier. I started to make new friends, get used to the southern hospitality, and meet new people. Just six weeks after my brave move, I fell ill, quickly. First, it was pain around my lower joints, and I just brushed it off and carried on. It wasn’t something to brush off. It progressed quickly to the point where I could not walk. I was petrified. Everything I had just worked towards was demolished and I had to move back home to New York. I was completely unable to care for myself. I couldn’t get up out of bed, and part of me didn’t even want to. I felt miserable and stuck inside my own body. I had tons of blood drawn and tested for just about everything. Blood work came back healthy, and they had pretty much no answer for my agony. I finally went to a Rheumatologist and she immediately knew why I couldn’t even bare the touch a sheet on my hips- it was Complex Regional Pain Syndrome (CRPS). I had so many questions, the first one being why me? I didn’t understand that there wasn’t an actual injury, it was my nerves saying that there was. Who knew that could even happen?! I spent a lot of time pondering that, but that wasn’t fixing it. So, I needed to. I started physical therapy three times a week and it is painful! I have great therapists working with me [who] push me to improve, which I have in the short weeks I’ve been doing it. As of right now, I can walk with my walker, but it’s certainly a challenge. No sophomore in high school wants to push around a walker period, let alone the thought of being surrounded by your peers with one. That’s when I feel it the most. The embarrassment of being in a school of 3,000 where everyone can blend in, yet the “girl with the walker” is VERY identifiable. I was having trouble staying positive, so I decided to advocate. I created a fundraiser in my hometown called “Walk The Hudson For CRPS“. It will be held on November 19, 2016 at 1PM on the Poughkeepsie side of the Walkway Over the Hudson. This being as rare as it is, I wanted to raise money and awareness for it. The cost is 10 dollars a person to walk and all proceeds will be going to the RSDSA for CRPS and RSD research. I’m overjoyed to do this and if one more person knows about this, it will be worth it. I plan to be a lifelong advocate, no matter how long my battle with this lasts. [Note: To register, or to donate, you can click here to be directed to FirstGiving]. I’m still in the very early stages of recovery, but my single piece of advice to those recently diagnosed is it’s okay to be afraid. It’s okay to wonder why of all people this happened to you. Just don’t stay there forever. As cliché as it sounds, there is light at the end of the tunnel. As excruciating the pain is, PUSH THROUGH. If I can do it, you can too. Appreciate the “get well soon’s” and “hang in there’s”, people do mean well. I’ve humored myself enough to tape Mercedes Benz emblems to the side of my walker, because that comic relief gives me my sanity when I feel like I can’t do this any longer. Laugh, cry, do whatever it is you need to. But whatever you do, never give up. I hope my story inspired you to share yours, as a community we’d love to hear it. Keegan would like to challenge you to make your assistive devices your own. Share pictures of how you’ve customized your equipment. Share your pictures with us during this CRPS Awareness Month through any of our social media forums! Use #WeAreCRPSstrong in your posts.